Mark my words – Chenin Blanc wines are the new little black dress. Comfortable, sleek, versatile and sophisticated, this white grape from France is making a new entrance to the big world of wine lovers. Thank the younger generation of drinkers who crave the unique, the little-known yet delicious in their beverages. But everyone wins. Chenin kicks boring ‘ole Chardonnay in just about every way, so welcome it into your world and onto your table. Chenin Blanc is originally from France’s Loire Valley region, making its way into various levels of sweetness in wines labeled Vouvray. In its home country, Chenin tastes luscious, slightly to very sweet and offers a cocktail of peach, nectarine and lime. Paired with a meal of varying flavors and to balance out an acidic meal, it can be magical. Add some bubbles to this grape mix and you’ll find Crémant de Loire, the same delicious magic but with a little sparkling added in. But as much as I enjoy Vouvray, the bone-dry versions of Chenin Blanc are more intriguing to me these days. My love-hate relationship with sugar prevents me from reaching for the sweeter wines in my wine rack. 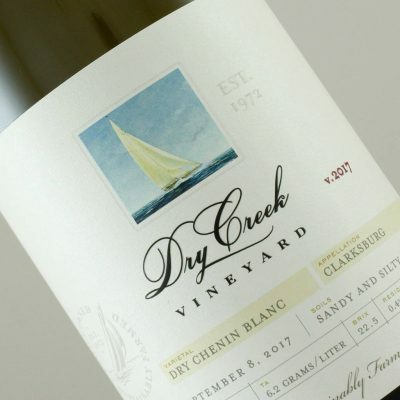 One of the first California wineries to embrace and “own” dry Chenin Blanc, Dry Creek Vineyards in Sonoma County has produced one since 1972, every vintage. I’ve gushed over it many times over the years (and bought it for my wine rack), simply because the price ($15) and quality hasn’t wavered. And continues to impress. Their grapes come from the Clarksburg AVA in northern California, where the warm weather and consistent sun appeal to Chenin. In fact, the majority of wineries that produce a dry Chenin Blanc source the fruit from Clarksburg, generating some well-earned fame for the region. Finally. Grown in the state for decades, Chenin was formerly blended with many other low-quality grapes and relegated to jug wines in the 1970s, so generations of drinkers associated Chenin Blanc wines with low quality. However, wineries like Dry Creek Vineyard knew that it could be more and have proven it has. I love that they have kept the price low enough to encourage trial by new wine drinkers. Over in Napa, Pine Ridge crafts a Chenin Blanc/Viognier duo. Although it’s billed as dry, I’ve noticed the sweetness creep up over the years, perhaps responding to the masses’ need for sugar but it remains well made and interesting. Other smaller wineries that are producing excellent Chenin Blanc, while on a much smaller production scale than Dry Creek Vineyards are: Abbot’s Passage, Charles Krug, and Husch Vineyards. On the other side of the world, South Africa bear-hugged Chenin Blanc wines years ago, calling it Steen, maybe to confuse of all us. Or maybe they were trying to keep all that delicious juice for themselves. The name Steen was associated with the old co-op system that this country embraced long ago. But since the early 2000s, the wine scene has exploded with privately owned wineries so quality has improved dramatically. The Stellenbosch region remains the leader in grape production and Chenin Blanc is the number one planted varietal in the country. So they’re in it to win it. And win they do. Ken Forrester imports some of their Chenin to the U.S., crafting elegant, varietally on-point wines. I’ll be able to report back soon on more wineries when I visit this spring. The personality of different Chenin Blanc wines can vary, based on how it was made and where it was grown. Vinified dry, it has the crisp acidity of Pinot Gris paired with the body of a Chardonnay. Flavors of peaches, lemon/lime, straw, and lanolin are what I experience in a glass of Chenin. It pairs with a cornucopia of dishes, from cream sauce pasta to scallops in lemon/butter to hearty salads. Or a crappy day at the office, a fireside dinner, or a Tuesday night. Your pick. Embracing Chenin Blanc isn’t a tough job, if you open your eyes to its possibilities. You will begin to see more and more of this wine, making a comeback from the 1970s, and reclaiming its rightful place in your glass. I love Vouvray too but agree with you. Many Sacramento, California Delta producers are growing the grape. I believe it was put on the SlowFood Arc of Taste!